A while back, while a friend showed me a route he uses to avoid traffic between Hurlingham and Kenyatta Market, I happened to spot a Korean restaurant called New Seoul Restaurant on one of the many back roads in the area. I had never heard of the restaurant before and was surprised to find a Korean restaurant in Nairobi—I didn’t know that any existed. I was intrigued and made a mental note to check out the restaurant sometime (I still haven’t though). I am adventurous when it comes to food and have sampled my share of East Asian cuisine. Somehow, I’ve never gotten round to trying Korean food. I’ve done Chinese, Vietnamese, Thai, Japanese, and even Mongolian (at least that’s what they call it), but somehow, I have never done Korean. Have you? If so, what is Korean food like? If you’ve got any information, I would love to hear about it. I think I know the one you’re saying. A pal says that he saw many dogs chained up in the back. Let’s hope they’re there just for security. Seriously. I don’t know much about Korean food but you should definitely try Kimchi; a bit of an acquired taste though. Welcome to The ChickAboutTown community! What’s Kimchi? Is that Korean? Well, let’s hope the dogs were security dogs, but would it really be that horrible to eat dog? After all, we eat goat. How far apart are these animals truly? Hehehehehe…. Thanks so much for the link. First, I’ll read about it and then make sure I go try some! No, ridiculous! They don’t serve dogs! That’s a huge stereotype and quite offensive. 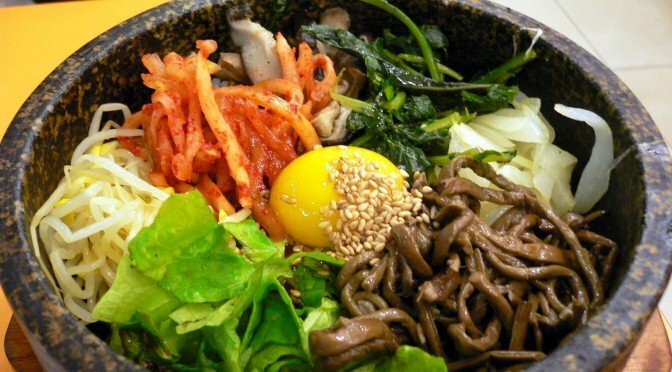 Korean food is great and quite high end east coast U.S. This restaurant is well worth the try. The food is delicious and very authentic Korean. The BBQ beef is cooked over charcoal stove and quite interactive if you go with a group. The atmosphere is great with open huts housing dining sets, where you can sit on the floor or chairs. The price is a bit steep, but if you love korean, it’s well worth it as I believe it’s the only one around. Thanks for your feedback on this restaurant. How long ago did you visit it? Have you visited recently (just to veify that it is indeed operational). I went there yesterday. I never went to a Korean restaurant before, but is was a very nice surprise. The food is delicious. The meat is cooked over charcoal stove. There plenty of small plates with salads and sauces. The atmosphere is great with open huts housing dining sets (we were in one with chairs). The price/person was about 15 EUR incl wine, beer, gin/tonic for some of us. I liked, my colleagues too. Thank you for the feedback. I still haven’t been – but I will definitely check it out the next time I am in Nairobi. hanging, or boiling them alive. alive in high pressure cookers. a very cruel and inhuman culture. Welcome to ChickAboutTown (though I find your comment very disrespectful of others)! I don’t understand how you can call another culture a non-culture. The minute a group of people do things a similar certain way, then theirs is a culture whether you approve of/agree with them or not. Out of curiosity, what culture are you from? I’d like to know because it would be my pleasure to dig around and try to find out ways in which your culture is “cruel and inhuman” to animals or possibly even to other human beings. If you are open to having this conversation, please respond to this comment, and let’s chit chat a bit about it. Otherwise, thanks for your feedback, though I request that you be a little more considerate of other people and their cultures when you comment here in the future. I’d really appreciate this. We lived in Nairobi 7 years and visited this restaurant many times for both lunches and dinner almost from the time they opened. Lunch in the garden setting is lovely and good choices on the menu. choosing you meats and having everything cooked and served around your “family table” is a delight. the name has changed several times, but staff and menu have stayed. It is located on Kindaruma Rd, which runs parallel to the Ngong Rd. It’s not far from the Ngong Rd. Uchumi supermarket. Owners are Christian. Another very good restaurant is Habasha on Arwings Kodhek Rd. toward Lavington. It serves very good Ethiopian food and we’ve found it to be clean and pleasant. I’m not sure if I’ve spelled the name correctly. Also there’s a new elegant restaurant in Karen called The Karen Country Lodge and Conference Center. To find it, turn off the Ngong Rd. on to the Miotoni Rd. just past the Lanana School and follow signs. We found it to have excellent continental cuisine, reasonable price and takes all credit cards all in a lovely garden setting. Welcome to ChickAboutTown! Thanks for you input. From the sound of it, the Korean restaurant seems very pleasant. I will make a point of visiting it the next time I am in Nairobi. I agree with you, too, that Habesha is excellent – especially the food. I used to go there almost twice a week, right before I left Nairobi. You’re the second reader to tell me about Karen Country Lodge. It sounds exciting. I used to live on Miotoni Rd. about 8 years ago, so I have a good idea of it’s general location. As I said before, thanks for all the tips! First, to the OP saying Koreans eat dog, not true! I have lived and am friends with Koreans from various parts of the country and have researched Korean cuisine and I can tell you that dog is not commonly eaten, even in other Asian cultures, it’s only the very rural and still traditional peoples that do eat it. Koreans do eat all kinds of seafood though, some of which is a very acquired taste. Anyways, is this the only Korean restaurant in Nairobi and if so, can someone please five the exact location? Thanks for the clarification on dog eating and Korean cuisine – I will take your word for it. 🙂 As for specific directions, check out Radnich’s comment above. You should be able to find the restaurant with those directions. If you don’t know where Kindaruma Road is, then search for it on Google Maps. i go to the same restaurant in london (mainly for the excellent service and the food of cuz) and where shall we start? kimchi is a must cuz u havent had korean if u dont try it, then of cuz ‘bap'(sticky rice-a korean meal aint complete minus rice and i mean breakfast, lunch AND dinner!) and the dumplings? to die for!!! then there’s the meats…my fav being ‘bulgogi’….u know what? u try it, u gonna be going back so often they’re gonna be keeping a table for u! and if u find really helpful waiters…u’ve hit the jackpot my friend! Thanks for the brief introduction to Korean Food. As I think I’ve said in previous comments, that’s a cuisine that I know nothing about. I recently noticed a Korean Restaurant not far from where I stay in Dar (there’s a signpost somewhere near JKT, near the Mlalakua Bridge); you’re giving me the motivation to check out the restaurant soon! I’ve really searched for a korean restaurant since last year. This is great info. Thanks will def go there. I’ve visited seoul before and my favourite was ‘Takalbi’ and ‘sangiobsal’ too i realy hope i can get this there. About the dog: i heard people talk of ‘Ke-Kogi’ in seoul but i never got to experience it first hand. All the same, korean food is extremely rich, nutritionaly recomended sea_food, the art of eating with chopsticks; wow what rich a culture i must say:-)!! Thanks for your feedback. Leave me a comment once you’ve finally been to let me know how you found it. I look forward to hearing about your experience! This place is rated 1st for their services, dishes, presentations and all high standards in bbq. I won’t regret going again and again and my pals.. Welcome to ChickAboutTown! Thanks for your feedback on this restaurant.